FC Barcelona Lassa closed the regular season with a hard-fought win against Gran Canaria FS (4-7) on the final day of the championship. The culers finished on 70 points, just one point from Inter Movistar, who also won against Levante (5-3), and ahead of ElPozo Murcia, who were two points below. The Blaugrana will face the playoffs against Ríos Renovables Zaragoza, who finished in seventh place, and will have home advantage in a hypothetical semifinal. Sergio Lozano opened the scoring for Barça (0-1, minute 2), and grabbed his second (0-2, minute 15). Within a minute, the hosts were back in it (Juanillo, 1-2, minute 16), but Barca’s reaction was also immediate and Ferrao, with a great hit (1-3, minute 18), saw the lead increase again. A few seconds later, Juanillo scored another, meaning a crazy three minute period had seen four goals. 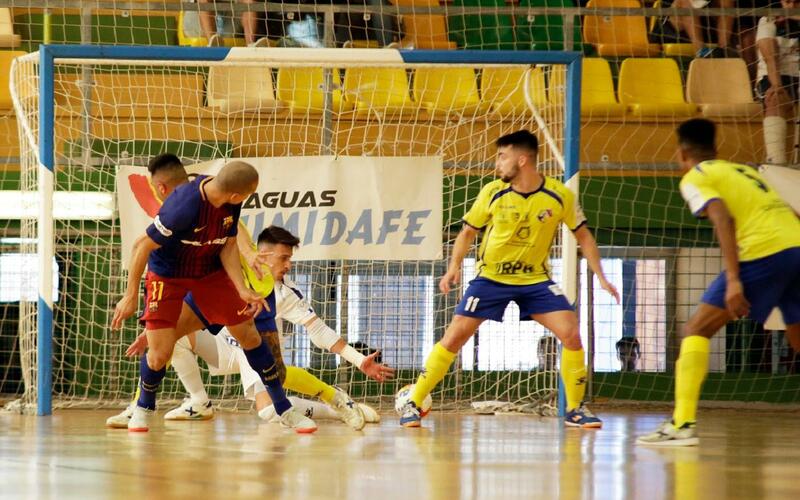 In the second half, Gran Canaria managed to tie the game (3-3, minute 26) with a goal by Nacho Gil, though Leo Santana took Barça back into the lead within a minute (3-4, minute 27). The Brazilian quickly added another (3-5, minute 28), but again the locals responded thanks to Víctor López (4-5, minute 30). A goal by Rafa López hit Gran Canaria on the counter (4-6, minute 31), and Rivillos’ finish on 36 (4-7), decided the game once and for all.